Kluh was a warrior from the dimension of Levram and a former contestant in the Battle Nexus Tournament. He appeared in the 2003 series. Kluh was a contestant in the Battle Nexus Tournament at the same time the Turtles first participated. He defeated a Fantasy Warrior in Tier 1, and Gorath in the second Tier. Between rounds, he metMichelangelo in the market area while in his small form; Michaelangelo accidentally insulted him, and Kluh transformed into full size. Just before attacking Mikey, they were transported off for the next round of fights, where contestants paired up by picking colored darts. Initially Mikey was supposed to fight Kluh, but he tricked Zat into taking his place. Kluh defeated Zat and went on to defeat Gen in the semi finals, but was defeated by Mikey (accidentally) in the final round of the battle. Following this, he was hired by Traximus to help overthrow the Supreme Leader ofTriceraton. Some time later, Kluh came to Earth to challenge Mikey for a rematch, this time with his father Ammag’s assistance and with the goal of making Mikey pay for his defeat … in blood. Despite gaining the upper hand in the battle due to his sheer strength and various dirty methods employed by his father to offset the safety measures of the Battle Nexus, Kluh was again defeated by Mikey (honestly this time). Kluh and his ilk are not-so subtle references to Marvel Comics’The Incredible Hulk. Kluh himself not only transforms from a smaller, scrawnier, apparently more hapless version into a larger, more powerful form, but his name is also “Hulk” backwards. His father’s name, Ammag, is “Gamma” reversed, and Gamma Rays are what first unleashed The Hulk from scientist Bruce Banner. Finally, their home dimension, Levram, is backwards for “Marvel”. 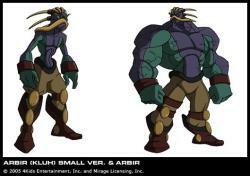 Before Grudge Match, Kluh was known as Arbir on 4Kids’ character guides.